Set in Dublin, this book revolves around Dr. Mike Wilson, a pathologist who is the city coroner. It's the latest in a series of stand-alone books from this author, all set in Dublin, where the author qualified as a doctor, and currently practices. In this novel, Mike Wilson is investigating the apparent suicide of Patrick Dowling, which happened a year ago. Worryingly, the previous coroner looking into what seems to be an open and shut case (Patrick was a known drug addict, and had hanged himself in the woods), was shot dead. And something just doesn't quite add up. Dowling was the son of a government minister, and somehow linked to a drug dealer, Jonathan Redmond, according to Detective Inspector Pamela Roche. And as they talk about the case in a local cafe, someone leaves a laptop case behind, containing a bomb. Was it meant for them? And if so, who doesn't want Mike to find out what really happened to Patrick? The rest of the book deals with Mike's persistence in getting to the truth about Patrick's death, while putting his whole family (wife and two children) into grave danger. He just can't help himself, despite his wife's pleas to drop the case. Her fears for her family put his marriage in jeopardy, but Mike is on a mission, and he is the only man who can unearth the real story behind Patrick's death. 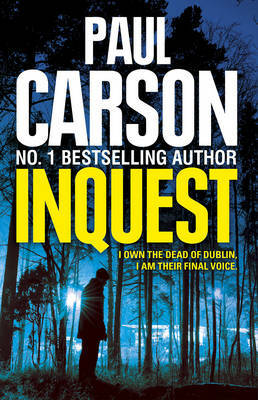 INQUEST is a story full of danger and intrigue, but not so appealing to me I'm afraid. All a bit predictable and most of the characters are a bit two-dimensional, although the background of Dublin/Ireland, and recent financial troubles is worked into the plot fairly well. Having said that, I'm sure this type of thriller will appeal to some, perhaps to those who like the John Grisham style of novel?